Utilities Employees Credit Union recently announced its 2013 Student Scholarship Contest for students who are family members of workers in the energy or utility industries and students pursuing employment in energy-related fields. This spring, UECU will award two $1,000 scholarships to students with a family or academic connection to the energy / utility industry. Utilities Employees Credit Union (UECU), a virtual credit union serving the utility and energy industry nationwide, recently announced it will grant two $1,000 awards this spring to the winners of its 2013 student scholarship contest. Students who are pursuing employment in energy-related fields, or are family members of energy workers or utility workers, are eligible for UECU membership, which is a scholarship eligibility requirement. Each year, the organization announces a new theme for entries to the UECU Student Scholarship Contest, which is open to UECU members who are about to enter or are currently attending college or advanced training at an accredited institution. 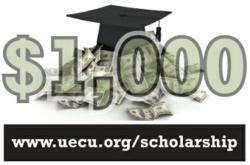 This year, students may submit a short essay or video on the current topic, “Tell your family why they should join UECU,” by following the submission guidelines provided on UECU’s scholarship program webpage at http://www.uecu.org/scholarship. The deadline for contest submissions is April 30, 2013, after which submissions will be judged and scholarship winners announced for the two entries that best express the benefits of UECU membership to students’ family members, and/or to other workers and families in the utility and energy industry. Utilities Employees Credit Union is a nationwide, virtual credit union providing financial services to utility and energy workers and their families since 1934. Its membership includes the employees of 600 companies and members of Energy People Connect, an association for individuals currently employed or pursuing employment in the energy industry. UECU is among the two percent of U.S. credit unions to receive an A “Excellent” Weiss Rating for financial soundness and one of the few financial institutions to reward its members with a year-end bonus dividend, which last year totaled nearly $1 million. To learn more about UECU, visit http://www.uecu.org.